Once again, inspired by real World War II photos, Vladimir Demchenko created a nice series of figures - Barberwaffe depicting German tankers on unusual poses for war conditions like haircut, hair washing and shaving which will bring realism to at-rest dioramas. First kit of the series B6-35117 Barberwaffe (1) is a two-figure kit of a field haircut. BRAVO-6 also released the other Barberwaffe two single figure kits; (2) and (3). Kit comes in standard light brown cardboard box labeled with a photo of the painted figures. Inside the box; figure bodies , arms and PE parts are inserted into seperate transparent zip-lock bags. Parts are cast in medium gray resin and represented with easy to remove casting blocks. Resin quality is good, details are crisp and clean. There is no casting mistakes, air bubbles, flesh resin or seamlines to clean. Another prime and paint kit from BRAVO-6. Figures come as bodies with heads and two seperate arms. Facial details and German military style haircut are well defined on both figures. They wear Panzer Trousers. Details of the trousers like button fly, four pockets with scalloped single-button flaps and adjustment belt with metal buckle, cloth folds and wrinkles are well represented. As for footgear, they have Long boots. Figure-A - Barber is posed standing to cut hair and wears a pocketless Army shirt with long sleeves and half-open in front with four buttons and Army Trousers Suspenders. Figure-B is posed to sit having a haircut. He has bare chest and holds a towel with his left hand covering his upper body. Hand holding the towel and folds on towel are very well defined. Arms ; Two arms of Figure-A and one arm of Figure-B come on same sprue. Arms of the barber has upfolded sleeves. Right arm is posed to carry the scissors and left one is posed to hold the hair. Figure-B sits on two German Army jerry cans. Handle and lid are given as seperate parts. 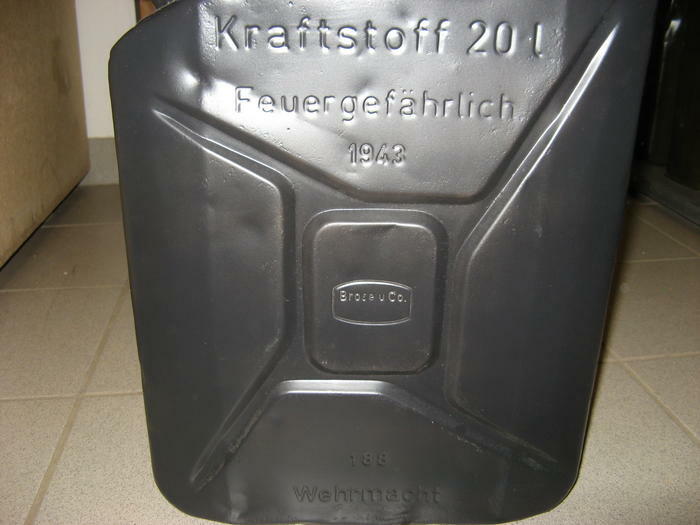 Markings with embossed letters like Wehrmacht, Kraftstoff 20L - Fuel 20 liters and Feuergefährlich – flammable are well defined on both sides. Two scissors and an eye glasses are given as PE parts. A very nice subject, great sculpt and flawless cast. Absolutely a great kit to create different World War II scenes. Highs: Very nice subject,poses, sculpt and cast. Ease on assembly with less parts,useful photoetched parts. Verdict: Great kit with rare poses to add realism to World War II dioramas. Fantastic!!! This has so much potential.